It's Tracktion, but not as you've known it before. 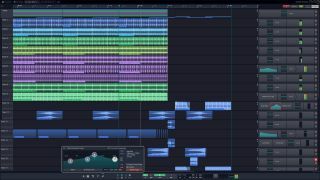 After previewing it at the NAMM Show, Tracktion Corporation has now released T7, the latest version of its affordable cross-platform DAW. At last eschewing the rather low-budget look it's had since version 1, this immediately gets off on the right foot with a classy, modern new paint job. More important than that, though, are the new functional features and technologies it's said to introduce without hindering that famously intuitive and fluid single-screen workflow. The headlines include a complete overhaul of the Racks environment; the ability to open multiple browsers at once, enabling auditioning and import of samples from several simultaneous locations; automated setup assistants and project management improvements; all-new DSP effects; and the intriguing Clip Layers (patent pending), which "allow for immersive editing right at the clip level". "With T7, we've taken the Tracktion paradigm a lot further," explains Tracktion Lead Developer Dave Rowland. "In addition to a great looking, more dynamic user interface, there are a lot of practical improvements designed to boost productivity. However, I'm most excited about the new tools for manipulating clips and plugins. With unique features like these, T7 will take users in new directions." You can buy T7 on the Tracktion website, where a demo can be downloaded and the software can be purchased for $60. It runs on PC and Mac.